The mayor of an Alaskan town and her elderly mother were killed after they were struck by a tour bus near the National Mall in downtown D.C. Wednesday night, police say. The crash happened just before 10 p.m. near the National Archives building at 700 Pennsylvania Avenue NW. The Eyre bus was making a left turn onto Pennsylvania Avenue when it struck Monica Adams Carlson and her mother, 85-year-old Cora Louise Adams, as they were in the crosswalk, the Metropolitan Police Department said. Both women were taken to the hospital, where they died of their injuries. The pair were in D.C. to see the holiday decorations and loved visiting Washington, Carlson's brother-in-law, Steve Hites, told News4. "Both of them were avid lovers of Washington, D.C. The nations capital was a placed they loved to visit," Hites said. Carlson, 61, was the mayor of Skagway, Alaska, a town about 100 miles north of Juneau with a population of about 1,100 people. Carlson was a write-in candidate who was elected to a 2-year term in 2017, according to the town's radio station KHNS-FM. "She leaves some very large shoes to fill in a very small town where we all watch after each other very closely," Hites said. Carlson's mother was a resident of the lakeside town of Elbe in Washington state. Video from Wednesday's scene showed a tour bus parked on the street near a large area that was taped off by police. Several police cruisers had their lights on and officers could be seen stepping inside the bus. Eyre Bus, Tour & Travel, the company that operates the tour bus, released a statement expressing their sympathy to the family. "We are cooperating fully with authorities in the investigation of this incident. Eyre places the safe transportation of our customers as well as those we share the road with as our number one priority." the statement went on to say. It's not clear whether the traffic lights were red or green at the time. Police are reviewing traffic camera video to see if Carlson and Adams had the green light when they crossed. "We do know they were in the crosswalk based on the information that we have, but that's the other information that we're verifying is what the signal timing was for both the vehicle and the pedestrians that were involved in this crash," Assistant Police Chief Jeffery Carroll said. The driver of the bus was cooperating with the investigation. Blaine Mero, office administrator for the Skagway Chamber of Commerce, says locals are in shock and grief over the news. Police say the crash was very similar to an incident that claimed the lives of two woman on Feb. 14, 2007. The woman were hit and killed by a Metrobus in the same intersection. Metro settled a lawsuit with one of the victim's husbands for more than $2 million. DDOT added a left-turn lane and left-turn arrow to the intersection following the crash. 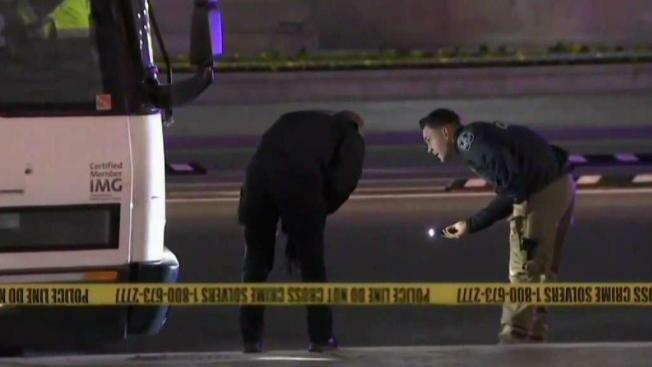 Police investigate at the scene where a tour bus fatally struck two women near the National Mall on Wednesday, Dec. 19, 2018. One of the women was identified as the mayor of an Alaskan town.